Today’s Modern Window Blinds Can Be Customized To Fit Any Décor. A window blind is made up of a number of materials that are designed to have rotating horizontal or vertical louvres to control the amount of light that comes into the room. By manipulating these louvres, you can maintain privacy, yet still allow light in to illuminate the room. Window Blinds are made up of many different styles including fabric, aluminum, wood and a faux wood material. Each one has their own unique characteristics and provide many benefits to the homeowners. Aluminum blinds provide an almost unlimited choice of colors to match almost any decor and tend to be the most affordable. 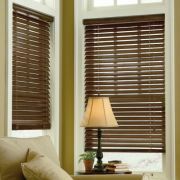 Whereas wood blinds and faux wood blinds provide excellent style as well as durability. Plastic is often used at the vanes on vertical blinds for their light weight as well as color options. Fabric vanes on vertical blinds provide the widest range of light filtering and because of their light weight can be used on large windows. Often our clients will ask us which blinds are best for us. The answer is, that depends on your needs, and what you want your blinds to do. If you want easy access through a patio door, horizontal blinds may not be best for you and we would recommend vertical blinds. Whereas if you need a stylish window covering for a formal dining room, we may recommend a horizontal wood blind. To discover which blind would be best for you, we invite you to take advantage of our free in home window covering consultation with one of our window design experts. Give us a call at 775-322-8833 to schedule one now or fill out the form to your right. Or click on the link below to take you to a specific product page. When It Comes To Natural Beauty, Nothing Beats Real Wood Window Blinds. Beautiful, elegant and designed to work in just about any decor. The Beauty Of Wood With Exceptional Durability, Our Faux Wood Window Blinds Are Guaranteed For Life. When you wan the look of wood, but need exceptional durability and light-weight, faux wood is the right choice.